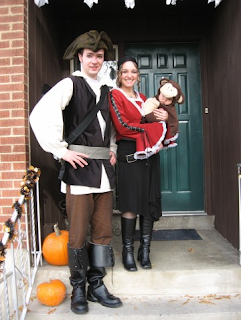 Will and I were pirates and Liam was our "not-so-undead" monkey. I used Simplicity 4914 for my pirate shirt. It is a fairly "advanced" skill level pattern, but still really reasonable. Maybe it's because of the fabric choice, maybe it's because it has a lining, I'm not sure, but this shirt has a nice professional costume feel when it is completed. Be warned though, this shirt pattern runs BIG so plan on cutting out a size smaller than your measurements. Will's vest and pants come from Simplicity pattern 4923. The vest is fairly simple, but the pants were on the difficult side. Those pants are so funny. 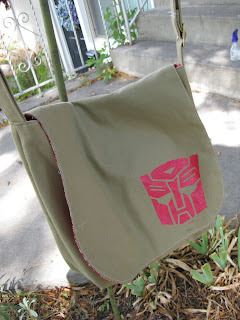 You actually pull the flap up over the front and button it. A usable flap! Kills me every time I think about it. (It's the flap that is the difficult part.) Not to mention they are capri length pants, so funny to see on a man. Will's shirt came from Simplicity 5023. The shirt pattern actually runs a little small if I remember right, so plan on cutting out a size bigger. Actually, I wouldn't use this shirt pattern. It was an annoying pattern, very illogical. Perhaps it was meant to be historically acurate, but this pattern was a pain with all of it's weird gussets and I can't think of why anyone past or present would want to take so much time on one shirt especially if you had to sew all of your clothes. I've since sewn the pants from this pattern too. They are on the advanced side of things, but definitely reasonable unlike the shirt. The pants run big though, so cut out a size smaller. 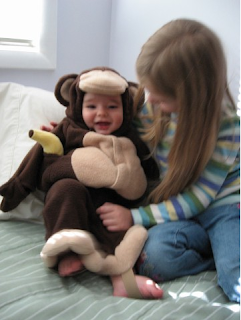 Liam's monkey costume was purchased by my mother-in-law from Old Navy and it has been well used. Liam used it again later in the year to make a little movie for his Uncle Ben who is serving a mission for the Church of Jesus Christ of Latter-day Saints in Peoria, Illinois. Then, cousin Cael used it last year for Halloween. This year, cousin Aria is using it as the monkey music box from Phantom of the Opera. It's a nice WARM fleece costume, so if it gets cold on Halloween where you live too, I HIGHLY recommend Old Navy costumes.